The majority of the anime that I have been watching lately is not that recent, as I have been exploring a wide range of titles that I missed out on the first time around. But with the end of 2013 rapidly approaching, it seemed like a good opportunity to begin watching some of the anime that has aired over the past few seasons. The first one I decided to pick up was The Devil Is a Part-Timer!, which aired this past spring and was produced by White Fox (Steins;Gate, Jormungand). Based on the synopsis, I was expecting this to be a silly romp that I could watch in between the rest of my current queue and while it definitely has plenty of comedic moments there was a lot more to this show than I had anticipated. 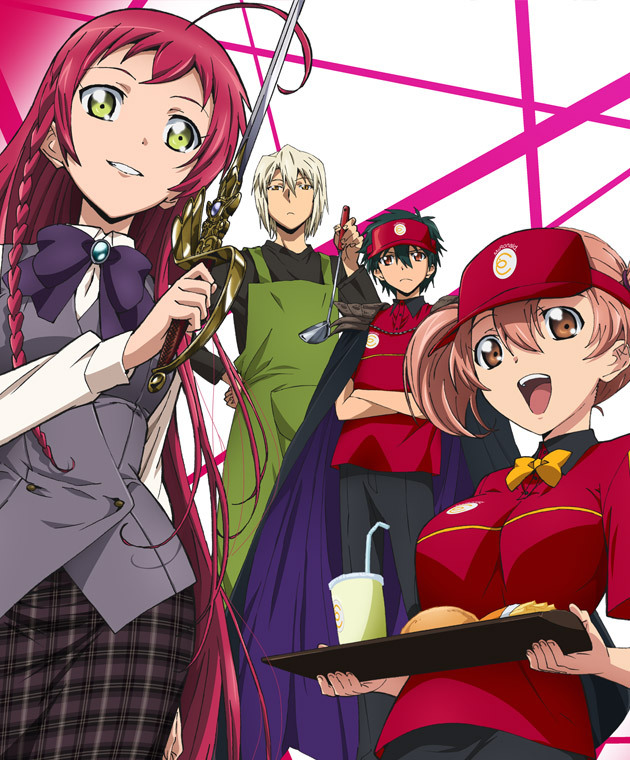 The Devil Is a Part-Timer starts off in the world of Ente Isla, where King Satan and his army are battling the Hero Emilia and her companions. Satan and his top general Alciel are cornered and escape through a magical portal which takes them to modern day Tokyo. 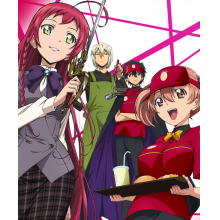 Magic is not plentiful in the modern world so both are reverted back to a form that makes them resemble humans, so the two take on more conventional names (Mao Sadao and Ashiya Shiro) and Mao gets a job as a part-time employee at fast food restaurant MgRonald. Based entirely upon that setup, I had expected the majority of the show to be a comedy based around Mao’s inability to adapt to the modern world. While this was a device the series used on occasion, it wasn’t what it solely relied on and that’s one of the major reasons I found myself enjoying it so much. Right from the very start it is clear that The Devil Is a Part-Timer isn’t trying to set itself up as another fluff comedy show, as the first episode begins with a fairly intense and very well-choreographed fight scene that looks like it could have been ripped out of an action anime. Since they are from another world, both Mao and Ashiya both speak a made-up language when they first arrive in Japan and this leads to a misunderstanding with the police who believe they are both cosplayers from a foreign country. It doesn’t take long before the two both use what little magic they can to speak Japanese and Mao begins working part time at MgRonald while Ashiya becomes the housekeeper who spends his days researching about Japan and the world they’re in. It doesn’t take long before the cast multiplies, and the hero Emilia (Emi) is found to be working as a call center agent while other inhabitants of Ente Isla make their way over throughout the course of the series. As the show progresses, it becomes less about the fish out of water scenario and more on just how well Mao has adapted to his new life. While it isn’t fully explained why the former King Satan is not only trying so hard at this new venture or why he seems to like the human race after spending a long time exterminating them on Ente Isla, his change of heart is used for some gags and plot points. The thirteen episodes are built around several major arcs, with characters from Ente Isla serving as antagonists that fight both Mao and Emi for various reasons and become part of the everyday cast once they are defeated. In between these fight scenes are more comedy focused and slice of life moments, which is led by the character personalities. What was particularly interesting was that the animation adapted to whether a scene was focused on action or comedy, making The Devil Is a Part-Timer! have a fairly distinctive look. If I didn’t tell you that the two images below were both from this show, would you think they were from two separate series? Since this show is primarily a slice of life/comedy it relies on its characters to keep things interesting in between the action sequences. This is where The Devil Is a Part-Timer! really shines, as its cast is quirky enough to make everything come together and grab your attention. On the demon side, Mao is probably the most normal as he has adapted to life as a human a little too well and seems oddly excited about moving up the ranks at MgRonalds. The majority of the moments where Mao really shines are during battles where he gets to take over as a badass, but I also liked some of his day-to-day interactions with the rest of the cast. Ashiya starts off seeming like he is going to play a bigger role in the series and has a level of devotion to Mao that results in some humorous situations early on, but he gets subjugated to bathroom humor status and plays a much smaller role in the later episodes which was a bit disappointing. Hanzo (Lucifer) was the one that I enjoyed a bit more, as he starts off as an adversary and then later joins the demon household as a NEET that has a habit of spending their entire budget on online shopping and other activities. As for the remaining main cast, the hero Emi is a play on the tsundere trope but her character’s handled in a very interesting way. Emi’s father was killed by Satan’s army in the other world, and she has a very hard time understanding his sudden shift in personality in modern Japan. This is only touched upon a little bit, but her reactions are reasonable considering the circumstances and she’s a lot more likeable than your average tsundere. The final Ente Isla transplant Suzuno is a grand inquisitor with the church that has come over to kill Mao in Japan, but like Emi finds herself hesitating after witnessing his change in attitude. She’s also the one that the fish out of water situation is applied to the most, as her attempts to adapt to life in modern Japan don’t go very well. And then there’s Chiho, the one human character from Japan that gets to take the spotlight. Chiho is Mao’s junior at MgRonald, and she has a major crush on him, and is one of the only people that find out that all of the main characters are from another world. She’s also completely adorable, and has a tendency to react with facial expressions that add to the humor of situations (see the second image above). Despite the fact that the cast of characters worked so well together and I enjoyed all of their particular quirks, the main issue I had with The Devil Is a Part-Timer is that there just wasn’t enough happening plot wise. It didn’t seem sure throughout the 13 episodes whether it wanted to really dive into the Ente Isla back story or just spend time on action and silly humor, and as a result the episodes often felt disjointed. There are plenty of elements about the Ente Isla dynamic that are hinted at, but I was ultimately left with a lot more questions than answers and felt like this was a series begging for an additional season. I’ve become fairly used to this, as it isn’t uncommon for anime to be based on manga or light novels that are still being written but I was particularly bothered by the way it was handled here as the second to last episode ends a major arc and the final episode is one of the most filler-ish of the entire show. It felt like a fairly weak way to end things, and hopefully it’s simply a lead-in for another season somewhere down the road. White Fox did an outstanding job with The Devil Is a Part-Timer!, and as I mentioned earlier there are moments where it seems like you’re watching two separate series animation wise. The majority of the series adopts a slice of life/comedy feel, going for realistic cityscapes and backdrops along with exaggerated character expressions that enhance the comedy. I’ve always enjoyed anime where the humor is enhanced by just how over the top facial expressions and other body language is, and this show absolutely nails that aspect. When it comes time for the fight sequences the studio kicks things up a notch and presents well-choreographed and flashy animation that feels like it could have been taken from a show that was all about action. The attention to detail that is present throughout the course of the series really works in its favor, and it made The Devil Is a Part-Timer grab me a lot more than I had initially expected. As far as sound goes, the opening and ending themes were pleasant to listen to and fit the lighthearted feel of the series but weren’t pieces that truly grabbed me enough to want to look them up out of context. But the voice acting is absolutely great, and each of the actors helps to put their character over the top. There was a sense of chemistry between them that worked perfectly, and even though I recognized a lot of these voices from a slew of other recent anime I felt like they were able to deliver distinguishable performances. I may have been a bit disappointed by the lack of insight into the background of Ente Isla and the filler-ish nature of the final episode, but ultimately The Devil Is a Part-Timer! ended up being far better than I was anticipating and is one of the pleasant surprises from the spring 2013 season. The humor works and it’s a bit more nuanced than you might expect, and when combined with the quirky characters and standout action sequences this makes the series worth checking out. There’s quite a bit of additional potential here, and I can only hope that White Fox gets the opportunity to return to this story and flesh things out further.